Welcome to the first day of Drink Week! The next five days will feature fruit and herbal syrups, boozy infusions and shrubs that will have you planning parties to feature your new specialty cocktails and mocktails (and because I’m not much of a drinker, you’ll definitely see as many virgin options as you do the spiked ones). As part of Drink Week, I’m giving away a Sodastream seltzer maker (click here to enter the giveaway). You didn’t think you’d seen the last of those black raspberries, did you? I had a whole flat of those gorgeous little berries to use, so they may well turn up even a third time (if all things go as planned). Let me share a secret about myself with you. I am a sparkling water lover. Rarely does a day go by (particularly during the summer months) when I don’t pour myself a glass of fizzy water. Often I drink it plain, or with a squirt of lemon juice (one of these dehydrated lemon slices works too). Sometimes, I muddle a little bit of runny jam into my glass (it’s a great way to use up something with a less-than-perfect set). And occasionally, I make something designed just for stirring with seltzer. 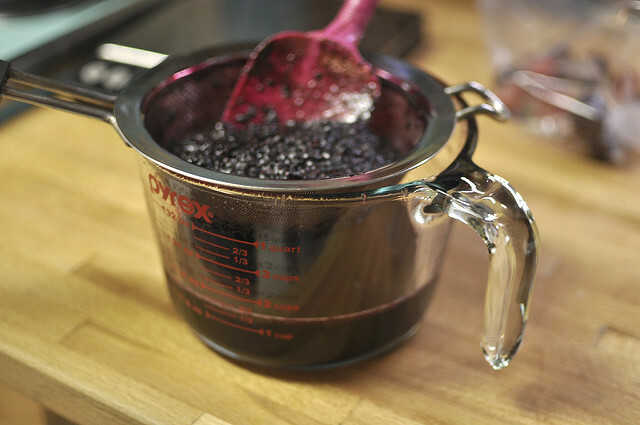 For this syrup, I measured out 3 cups of black raspberries and used the Vitamix to pulverize them into a delicious goo (wear an apron and keep it away from light-colored counter tops, it stains upon contact). If your kitchen happens to be lacking a fancy blender, you could also pulse them in a food processor or even just go to town with a potato masher. I scraped the puree into a saucepan and stirred in 1/2 cup water and 1 cup sugar. I brought it to a quick simmer and let it cook for 5-6 minutes. Because the starting puree was so thick, it didn’t need much time on the stove to come together. Using a very fine mesh sieve, I separated the syrup from their seeds. Don’t be afraid to really work the seedy bits and press firmly to remove the last bits of liquid. You’re not extracting liquid for jelly so there’s no need to be delicate or attempt to prevent cloudiness. At this point, taste your syrup. If it isn’t sweet enough, you can add a bit more sugar and return it to the saucepan until the sugar is dissolved. If it is too sweet, stir in a little lemon juice to balance the flavors. Because I hate waste, after the syrup was decanted into it’s own jar, I plopped the leftover seeds in their own vessel and topped it with 2 cups distilled white vinegar. After it spends a couple weeks imparting all that lovely black raspberry flavor into the vinegar, I’ll strain the seeds out and finally throw them away. After that, it’s just a matter of spooning a bit of the syrup into a tall glass and topping it off with a long pour of sparkling water. A couple of ice cubes and you have a refreshing summer drink. For the grown-ups in the crowd, you could add a bit of vodka or a fruity liqueur. Because this recipe makes a cup and a half of syrup, I popped it into the fridge and skipped any processing step. However, should you be facing a massive raspberry harvest (this technique works just as well with red raspberries or even blackberries), you could make up a far larger batch and process it in pints or half pints in a boiling water bath for 10 minutes. Just remember that sugar is a preservative, so if you cut the sugar content drastically, the syrup will not have as long a shelf life. 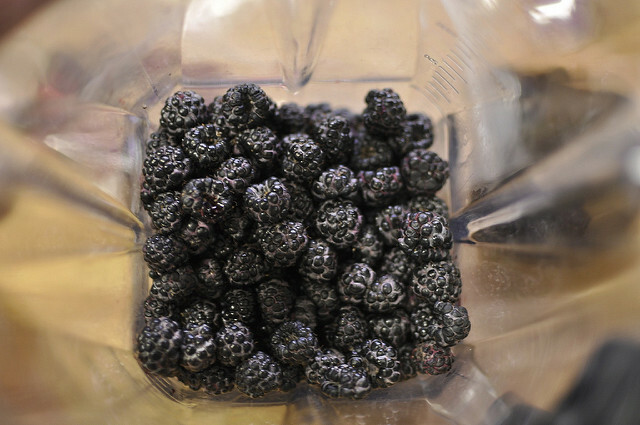 Now, make yourself some black raspberry syrup and head over to enter the Sodastream giveaway! I’d love to win this! This is exactly what we need to keep the kids (and ourselves) happy on a wholesome diet with all the fresh produce and fruit we are beginning to have, two years into growing our own garden and orchard on our new property in the Santa Cruz mountains on the California coast. Hello kiwi-strawberry “soda”, blackberry fizz, blueberry blast!!! This looks delicious! I have a Sodastream and LOVE IT, but I just have to say that I’m in full support of drink week – I may have to do a drink week of my own at Eat Boutique! Have a great week! I’m an herbalist and I can’t even begin to imagine all of the possibilities-sparkling infusions of raspberry leaf (& raspberry juice) poured over fresh lime slices, mmmm. Now there is a great way to get the best uterine toning herb into your body! What else? The possiblities are endless! I could go on all day. yum! I can’t wait to make this delicious sip with tonic water or in a cup of iced black tea. thanks! I love the idea of saving the seeds for vinegar. That just made me really happy. What do you use the seed infused vinegar for? Sounds like a yummy vinaigrette salad dressing!! Holy cow, that looks delicious. We are headed to upstate NY and we can usually get lots of black raspberries up there. I’m enjoying imagining myself sitting on the deck sipping black raspberry fizziness. So looking forward to the rest of this week’s posts! I totally loved the recycled leftovers vinegar idea too! Awesome to make two things from one. I am definitely doing this with our raspberries when they come in. I was thinking of making a black raspberry shrub this year. Have you ever made one? 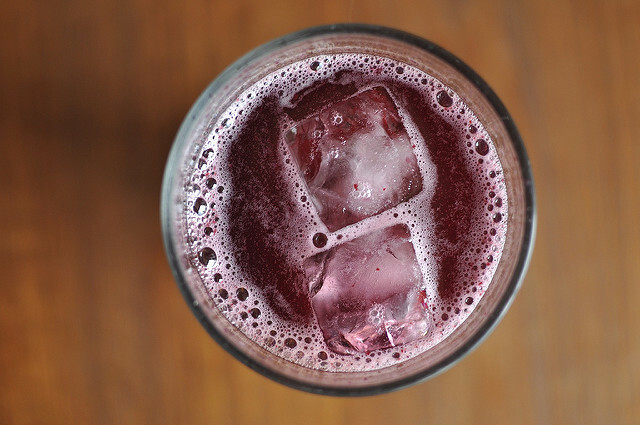 It’s another kind of drink concentrate that uses berries, sugar, and vinegar. Sounds kind of weird, but I want to try it! Great recipe. And great tip on the vinegar idea. Quick question. Given the berry seasons are so short, I’d love to bottle more and put away for storage. Any tips on how to do this safely? Could you can it like jam safely? Last question … please do a ginger syrup drink as well. I’m a ginger addict!! Sorry, I just posted the same question to your Sour Cherry recipe … sorry. I’ll take a closer look now. Thanks again … and thanks for the ginger recipe! Can’t wait to try it! 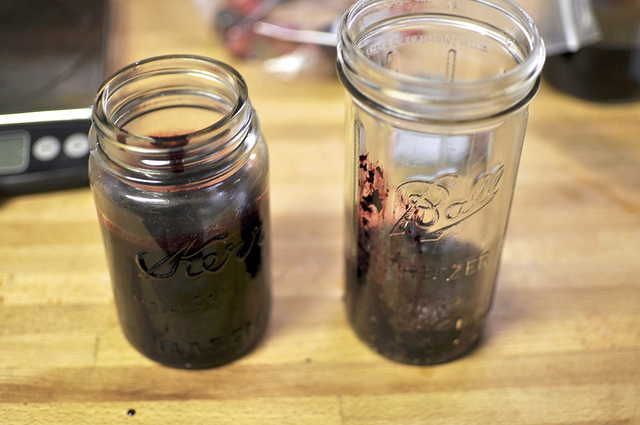 I just got incredibly, geekily excited about berry vinegar with the leftover seeds. SO HAPPY. Can’t wait to add syrups to things to preserve this year! Thanks for the inspiration. Ok, the syrup looks fab and is definitely on my to to list but what’s really got me is that tall smooth sided ball jar in the photo….it’s making me pant and swoon! I’m one of those canning fiends who obssesses about jars (weck, leifheit) as I do the food I’m canning. Where on earth did you get that jar? Wow! 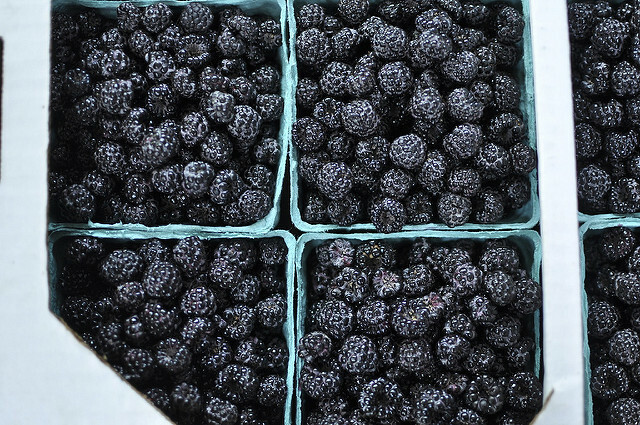 There are fresh black raspberries growing around my family’s home, and this is just what I want to make with some of those black raspberries when I go home. Thanks for the great idea! Love this idea. We are actually planning on pick some wild black raspberries here in the very near future. Most of them will go to making jellies b/c that is my husband’s favorite jellies. But, I love the idea of putting the pulp in vinegar. Would make a good starter for a salad dressing. Anyway, I was also wondering if you have ever tried making watermelon syrup. I am thinking of trying to do that to add to soda water for me & the kids to drink. Top Favorite Fruit for the Summer, however, my son’s also is LOVING wild black raspberries, he was really introduced to them this year. Just came into some black raspberries and was glad to find YOU were the one whose advice I could follow. I have a Twist and Sparkle which is great for the sometimes soda water drinker and has come in really handy with the mass quantities of fruit and herbal syrups I’ve been making! Thanks. I made this syrup with red raspberries last night. It turned out great. I was also excited about using the leftover pulp in vinegar. Excellent site! I made a double batch of red raspberry and a single batch of golden raspberry syrups last night. Thanks for the recipe! Wait! Feed the birds this winter! Simply freeze all that throw-away pulp and seeds in leftover containers now and pop out of containers to set outside for the birds in winter. The birds will love you! I am looking for somewhere that I could buy the black rasberry concentrate so I can make Jelly. I can not grow enough black raspberrys for jelly. I’m not aware of the availability of black raspberry concentrate. I use it in chutneys, salad dressings, adding acid to soups and stews, as well as in vinaigrettes. Can you freeze the syrup for longer storage? Like I say at the bottom of the post, if you want to keep this syrup for longer, I recommend processing it in a boiling water bath canner. I’ve not frozen it, so I can’t suggest how long it would last there.